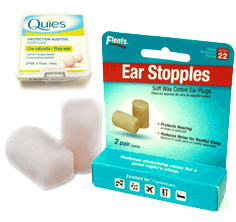 Moldable wax ear plugs generally consist of a blend of wax and cotton fibers. The cotton fibers help hold the wax ear plugs together, and the cotton also tends to make for a softer ear plug. When it comes to comfort, moldable wax and cotton ear plugs are very hard to beat. These ear plugs are designed to seal over the ear canal, rather than sitting inside the canal itself, and because they are moldable, wax ear plugs will fit virtually everyone regardless of ear shape or size. Too, wax and cotton ear plugs tend to soften in response to heat, so the longer you wear them, the more they soften and conform to fit your ears in response to your own body heat. Because of their top-notch comfort and fit, moldable wax ear plugs are an extremely popular choice for sleeping. Wax ear plugs don't protrude from the ear and continue to soften while you sleep, making them perfect for all-night wear and comfort, even if you sleep on your side. Moldable wax ear plugs are also a good choice for study, concentration, relaxation, and general hearing protection in mildly noisy enivornments. Wax ear plugs are also a fair choice for swimming and water applications; however, note that wax ear plugs are NOT recommended for outdoor swimming in hot weather, hot tubbing, or hot baths or showers, as they can over-soften or even melt in extreme heat. Moldable silicone ear plugs are overall a better option for swim and water usage. When it comes to sleeping, however, wax ear plugs are top-notch. Note that these moldable wax ear plugs don't offer as much noise blocking as other types of ear plugs (foam ear plugs, for example). This is not ideal if you're looking for relief from a very loud snoring bed partner! However, the lower NRR's on moldable wax plugs can also become a great safety benefit: these plugs block a little noise while still letting you hear your kids calling, your phone ringing, or your alarm clock buzzing in the morning. Whether moldable wax ear plugs are right for you depends on why you need ear plugs in the first place. Still, for blocking out low to moderate noise while sleeping, moldable wax and cotton ear plugs are absolutely excellent. Ohropax Wind Wool Ear Plugs (previously called Climate Wool) are peach-colored ear plugs made of wool for soothing protection during bathing and when ears are subjected to wind and weather. These moldable wool ear plugs provide an alternative to moldable silicone ear plugs. Ohropax Classic ear plugs have been an established noise protection product since 1907. The unique formulation -- cotton fibers soaked in a mixture of Vaseline and paraffin wax -- was so perfect right from the outset that it has remained practically unchanged up until the present day.